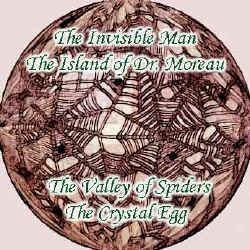 The Crystal Egg by H. G. Wells, performed by Patrick Horgan. The War of the Worlds is, of course Well's best known work - but this brief tale indicates that H.G. Wells had more than a passing interest in the red planet. Without giving too much away, the artifact that is the subject of the title would not seem too extraordinary today but this brilliant prediction of robotic planetary exploration would seem fantastic in the early twentieth century. Quatermass and The Pit, a BBC television science-fiction play that appeared in the late fifties, may have been inspired by this little gem of a narrative. For more information click [homepage].